Making slime! Oh my goodness… Where do I even begin? Making slime has taken over our lives this summer. Each year as summer break approaches, I have an idea in my head of how it’s going to be. We’ll all sleep in, pack a cooler and walk to the pool, play for a bit, come home for an afternoon rest, and then all hang out in the media room and watch a movie. Mark will come home from work with dinner from somewhere yummy, we’ll get our PJs on, and head to bed around 9:30. Then it all begins again the next day. But…it never seems to work out that way. Various reasons cause us to have to get up early, or run lots of errands, etc… This summer, however, the reason causing my summer not to work out how I have it all imagined in my head, is SLIME! 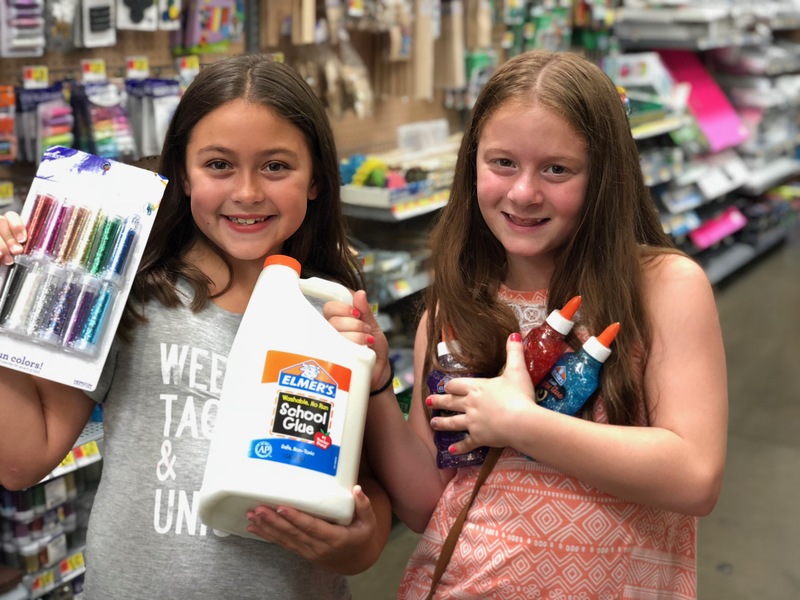 “Mom, I really wish you would get some ‘glow in the dark glue’ for my slime.” “Mom, mom, mom…” It’s July, and I can tell you that this mom is all slimed out. And I don’t think this slime thing is going anywhere. They’re just putting all new spins on it – – edible slime, slime with glitter, tie-dye slime, etc… So many different versions of slime. When will it all end? They used up an industrial sized container of glue, about 10 bottles of “special” glue, as well as all of my Tupperware. Why didn’t I have them use baggies, you might be asking. Well…I tried that, but according to my daughter, “Mom, baggies don’t work. Air gets in, and the slime gets old. Then we have to make it all over again. Can you just get some more Tupperware please?” Make it all over again? OMG…no!! So I gave her all my Tupperware. If you have no idea what I’m talking about, then count your blessings. And then answer this… “What rock have you been living under?” Slime is everywhere. Just today, as I was walking through the aisles of Target for my weekly therapy session, I noticed all sorts of Slime Kits. I have spent the last couple of months of my life making slime of all different kinds in my kitchen. I could’ve set up and sold the PERFECT slime kit! If only I’d thought of it first…I’d be retired by now. After I posted a few photos of my daughter destroying my kitchen, I mean a few pictures of my daughter conducting slime science experiments in my kitchen, she sent me a link to many other “better” kinds of slime. After seeing all of these, I was feeling quite inadequate..
She suggested that I try some of these with my daughter, and I suggested to her that since it was her great idea, that she should invite my daughter over and they could make these recipes for slime together! At this point, over half-way through the summer, we have making slime down to an art in our house, so it is not such a huge mess like it was in the beginning. The recipe we use is a very simple one, and it is never the same recipe two times in a row. Get a cup of warm water, and add about a teaspoon of Borax and mix it in. Slowly add this solution to your glue. Add your food coloring, if desired. However, my daughter has decided that white slime is pretty cool too, so sometimes she doesn’t add any food coloring. And don’t forget about the colored glue. Some of it is already a pretty color now, so food coloring isn’t necessary. Stir in the Borax solution until the slime starts to come together. For us, it seems to work better to work it with your hands once the Borax solution is mixed in. You can add more Borax solution as needed if it’s too sticky. And just like that, you should have SLIME! Hooray! Now go find some Tupperware to store it in, and start the process all over again. Because you know, one batch of slime is never enough! Okay…for those of you visual learners out there, below is a YouTube video of a little girl making slime. She is so cute. She goes through each step very carefully, measures everything out perfectly, and keeps her work space so clean. Maybe I should show this video to my daughter. This sweet little girl in the video has only one bottle of glue, and doesn’t make a mess at all. And…at the end, she shares her slime with her brother. The end result is the same, however, and everyone has a batch of slime, so I guess I shouldn’t worry so much. And I’m sure you noticed that my steps are a bit different from those in the video. Well…that’s mostly because I told my daughter to skip a few steps so she doesn’t use so many bowls! Whatever works for you, right? Because you can never have enough glue, right? After making many batches of slime using Borax, water, and glue, my little budding scientist wanted to try the recipe using saline solution, because “this is a better recipe” according to her. Pour glue into a container you want to use to mix your slime. In my house, the amount varies each time. The recipe calls for 12 ounces. Add 1 1/2 tablespoons of baking soda and mix with the glue. Add glitter, food coloring, or like we do, add pearls or beads with letters! Add 2 tablespoons of saline solution. Mix/stir the solution until the slime starts to form. In our house, it is much more fun to mix it all with your hands, but a spoon will work! 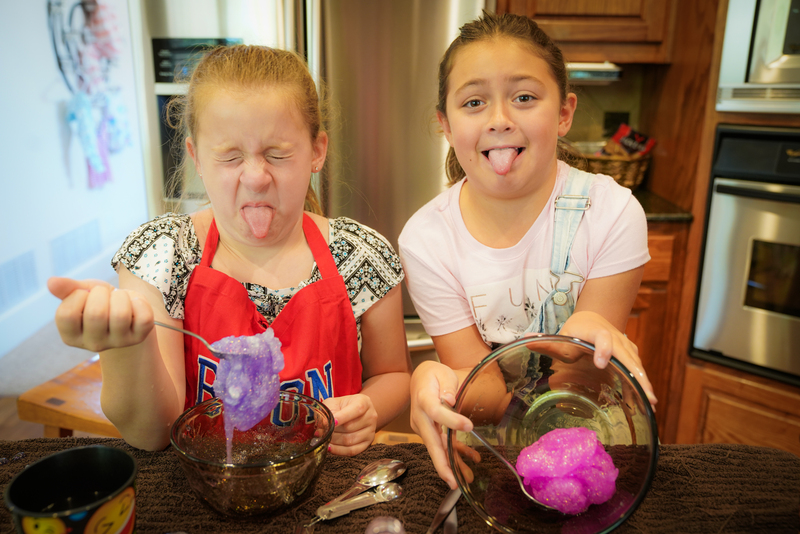 So there you have it… Making slime 101! If you haven’t yet, you will soon enough, and if you have, I feel your pain! I guess it’s better than sitting in front of the TV all day. It counts as science, right? In our house, we’re counting it as science. Even Jimmy Fallon is Playing Pokémon GO!